The beautiful weather of late allowed me the luxury of exiling Miss Oh Waily to the shade of our eaves for her messier activities. Perhaps you will have noticed the looming hand of doom coming out from under the table. This would be Mr Oh’s earlier art work, using the prone figure of Miss Oh as his template. Sidewalk chalk is great. She loves to scribble with it, and it comes off with the rain. How happy a clean up is that ?! Think of all the trees I’m saving. Anyway, back to the activities. Doing my “follow the child” thing, I put out the quinoa transfer for her to do. I thought it would be nice for her to have a new grain to handle, other than rice. It’s smaller, rounder, and is remarkably attractive for static electricity. It sticks to the spoon, the bowls, the tray, her, me, the table, the chairs and the flooring. Therefore it makes a complete mess when being worked with. I grew tired of wiping, sweeping and vacuuming indoors, so it was relegated to being an “outdoor activity” until she got bored of it. It is just another way for Miss Oh to indulge her current love of running her hands through, and handling all sorts of odd grain-like things. This sort of textural trying out and handling of things means coming up with more ideas for her to experience. I refuse to go to the bulk bins for this any more, so today I will be attempting to make a very simple pair of sandpaper blocks. Mine will be on whatever stiff card I have at home, since woodworking is not one of my skills. This may be asking for trouble, but I’ll try. The other activity that is in the picture is transferring by dropper. Its for the tripod finger grip, you know. And for strengthening the hands in advance of writing. 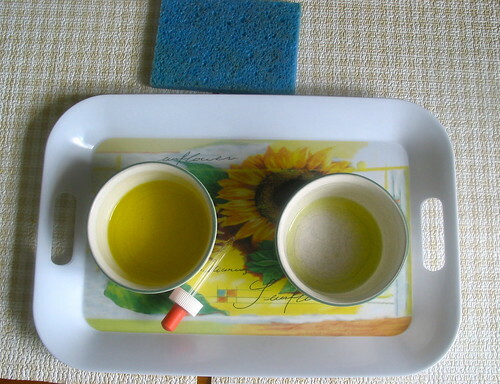 The activity is simple – using a dropper Miss Oh is to transfer water from one bowl to another. As you can see I used yellow food colouring to make it a bit more obvious and interesting for her. She got the hang of the dropper after a few goes, did half a dozen transfers and then she moved on. 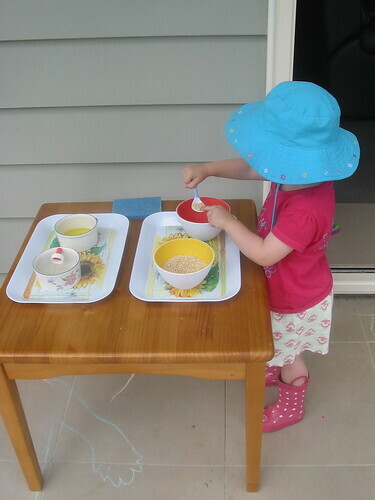 She went back to it a few more times but it is not a huge hit like the original rice pouring activity was. Still, I have another use for the dropper having just purchased red, blue and green food colours to go with our existing yellow. I see an art activity in our future. But before I go down the mixing colours road, I think I need to work on black, brown and grey a bit more. Oh, and if any of you locals happen to know where I can pick up a simple old-fashioned watercolour set for kiddies I’d like to know. My local Warehouse Stationery was devoid of such a simple item.